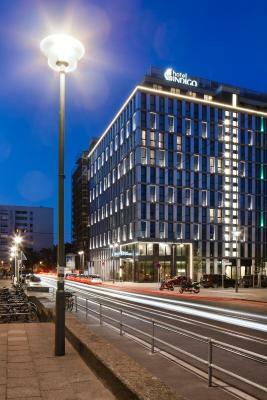 Lock in a great price for Hotel Indigo Berlin-Alexanderplatz – rated 8.9 by recent guests! The staff was really polite and friendly. Their breakfast is good and there are a lot of options to choose from. Room was clean and the bed was especially good. My husband and I really enjoyed our stay. It was walking distance to everything we wanted to see. The room and bathroom were very clean and modern. The big bed was very comfy and the water pressure in the shower was great! 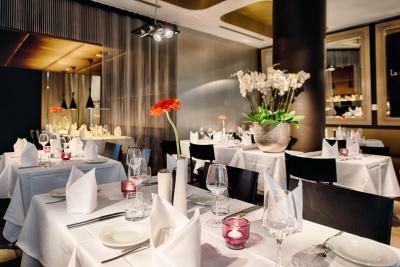 the location was brilliant, very close to the main train station, which made it easy for us to travel around the city. The staff were all super friendly and very helpful. Very helpful front desk staff and breakfast staff very attentive and friendly. The beds were not comfortable , the staff not the best and the room very small. it was clean and the gym was good. 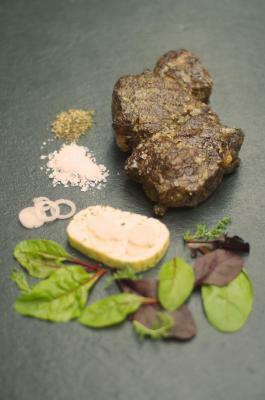 The food was decent but over priced. Good location, but the room was deceptively small compared to the pictures. I would not stay there agin. 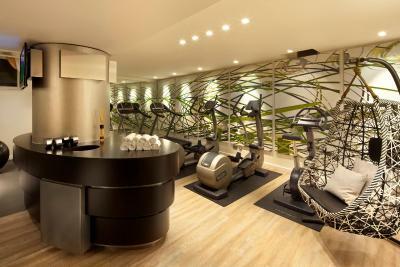 Very modern, well organized hotel in an excellent location. The rooms where nicely decorated and the beds were comfortable. I would stay here again without a doubt. We had a very clean and comfortable room. Very nice staff. Hotel is well maintained. Location is 10/10. Breakfast was pretty good. 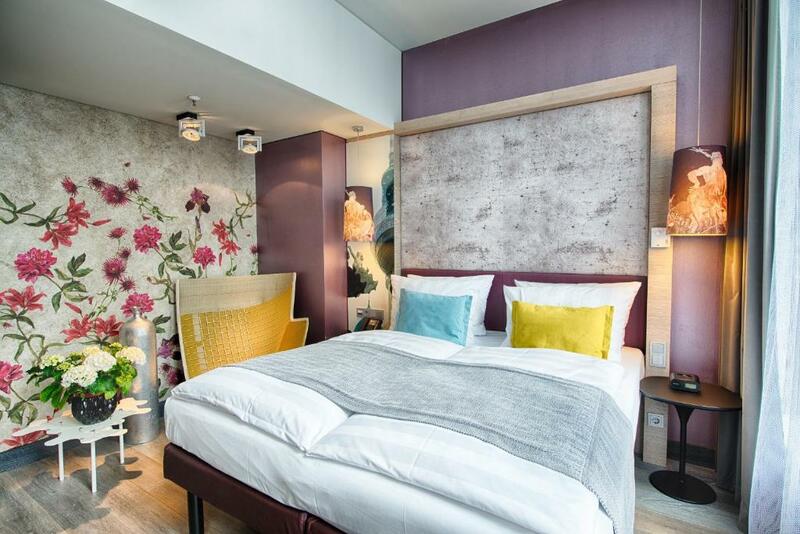 Hotel Indigo Berlin-Alexanderplatz This rating is a reflection of how the property compares to the industry standard when it comes to price, facilities and services available. It's based on a self-evaluation by the property. Use this rating to help choose your stay! 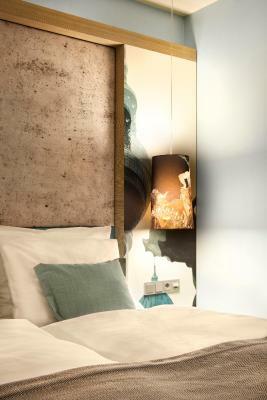 This boutique hotel in Berlin city center is only a 2-minute walk from Alexanderplatz Square. It features free WiFi, and boutique-style rooms with a flat-screen TV, free Sky channels, an iPod docking station, as well as free calls to 19 countries. Featuring individually decorated interiors, rooms at the Hotel Indigo Berlin-Alexanderplatz offer guests a mini-bar, an electric kettle with a free choice of coffee and tea facilities, as well as bathrobes and slippers upon request. 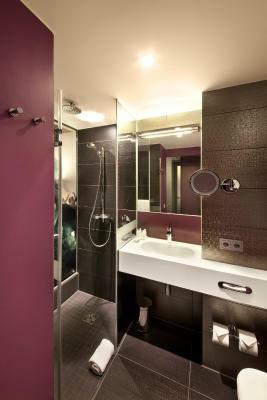 The private bathroom includes complimentary toiletries and a rain shower. 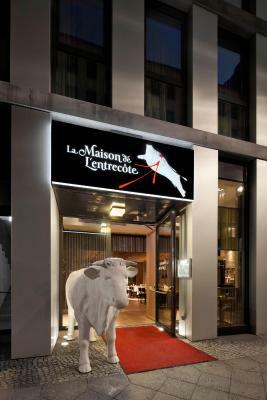 The hotel restaurant La Maison de l'Entrecôte offers freshly-prepared dishes featuring seasonal dishes made with regional ingredients. 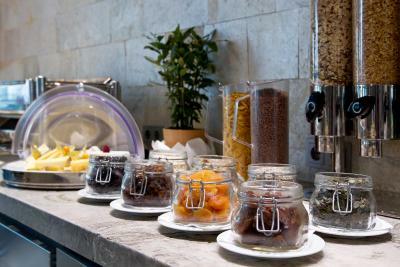 Guests can also enjoy a daily breakfast buffet, or relax with a drink at the well-stocked White5 Bar. 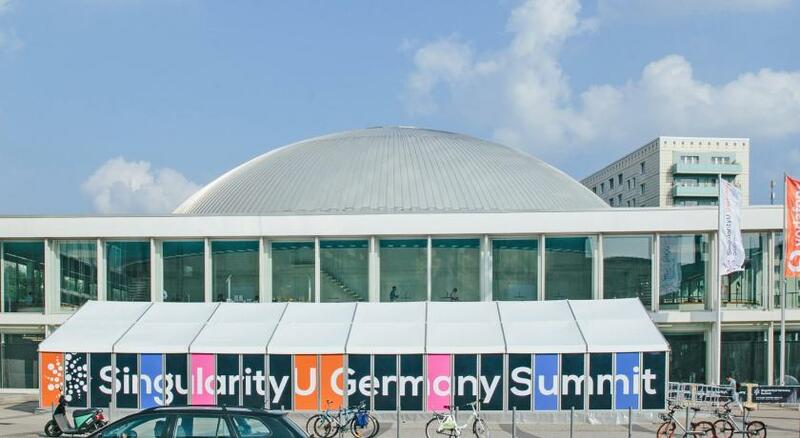 Berlin’s Museum Island and lively Hackescher Markt Square are a 10-minute walk away. 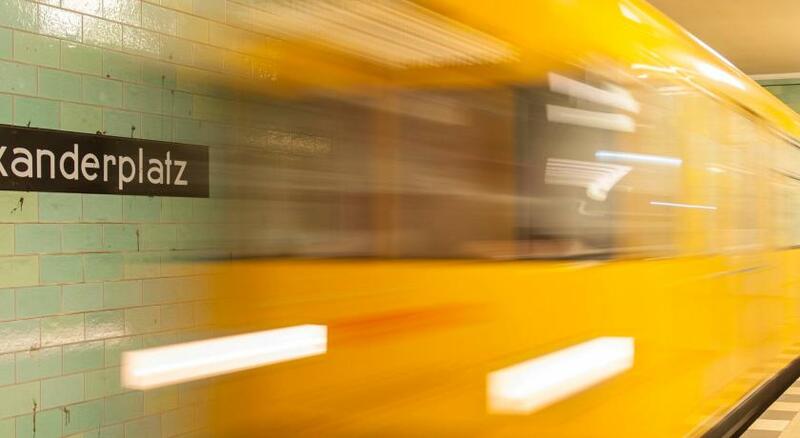 Guests can reach the Brandenburg Gate from Alexanderplatz via public transport in just 7 minutes. Alexanderplatz Metro Station and S-Bahn Train Station provide connections throughout Berlin as well as a direct connection to both airports. 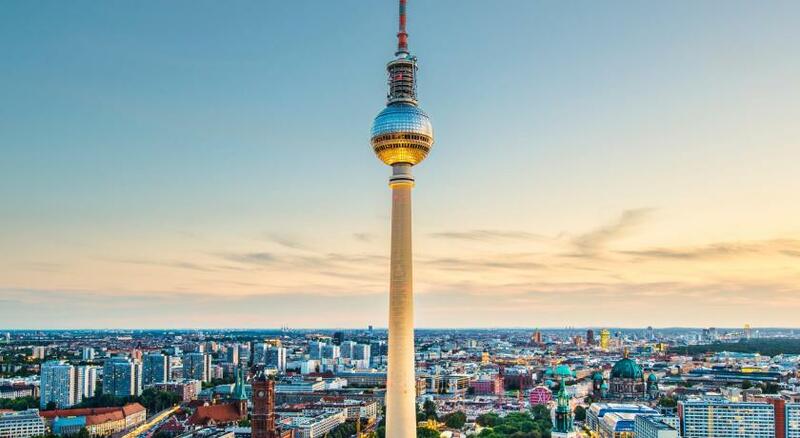 Tegel Airport is 7.5 mi away from Hotel Indigo Berlin-Alexanderplatz. 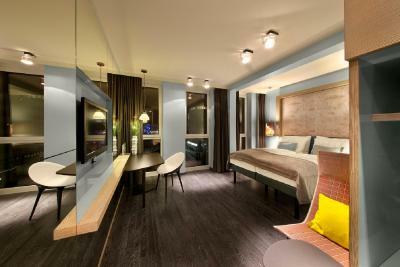 When would you like to stay at Hotel Indigo Berlin-Alexanderplatz? This room overlooking the courtyard includes free WiFi, hypoallergenic flooring, a flat-screen TV with satellite TV channels, an iPod docking station, air conditioning, a safe, a mini-bar, an electric kettle with free coffee and tea, a rain shower as well as complimentary toiletries. A bathrobe with slippers are also available upon request. Guests can also call 19 countries free of charge using the land line. This room overlooking the courtyard includes more space than the Standard category as well as free WiFi, hypoallergenic flooring, a flat-screen TV with satellite TV channels, an iPod docking station, air conditioning, safe, mini-bar, an electric kettle with free coffee and tea, a rain shower and complimentary toiletries. A bathrobe with slippers are also available upon request. Guests can also call 19 countries free of charge using the land line. This room overlooking the courtyard includes more space than the Standard category, as well as free WiFi, hypoallergenic flooring, a flat-screen TV with satellite TV channels, an iPod docking station, air conditioning, safe, mini-bar, an electric kettle with free coffee and tea, rain shower and complimentary toiletries. A bathrobe with slippers are also available upon request. Guests can also call 19 countries free of charge using the land line. This room overlooking the courtyard includes free WiFi, hypoallergenic flooring, a flat-screen TV with satellite TV channels, an iPod docking station, air conditioning, safe, mini-bar, an electric kettle with free coffee and tea, rain shower and complimentary toiletries. A bathrobe with slippers are also available upon request. Guests can also call 19 countries free of charge using the land line. This room includes free WiFi, hypoallergenic flooring, a flat-screen TV with satellite TV channels, an iPod docking station, air conditioning, safe, mini-bar, Nespresso coffee machine, rain shower and complimentary toiletries. A bathrobe with slippers are also available upon request. Guests can also call 19 countries free of charge using the land line. Some of the rooms have a private balcony with a wonderful view over the rooftops of Berlin. This room includes free WiFi, hypoallergenic flooring, a flat-screen TV with satellite TV channels, an iPod docking station, air conditioning, a safe, a mini-bar, an electric kettle with free coffee and tea, a level-access shower and complimentary toiletries. A bathrobe with slippers are also available upon request. Guests can also call 19 countries free of charge using the land line. 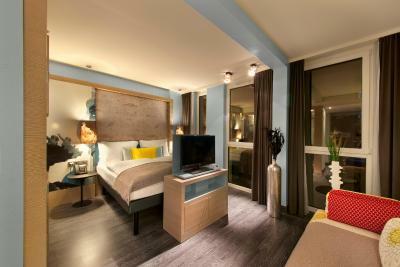 This suite features a private balcony with a wonderful view over the rooftops of Berlin. It includes free WiFi, hypoallergenic flooring, a flat-screen TV with satellite TV channels, an iPod docking station, air conditioning, safe, mini-bar, Nespresso coffee machine, rain shower and complimentary toiletries. A bathrobe with slippers are also available upon request. Guests can also call 19 countries free of charge using the land line. 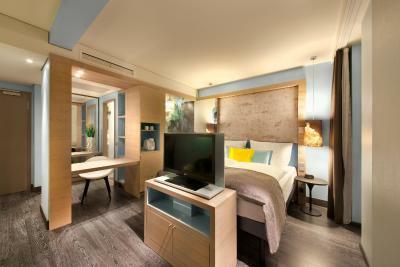 This suite features a mini-bar, iPod dock and bathrobe. 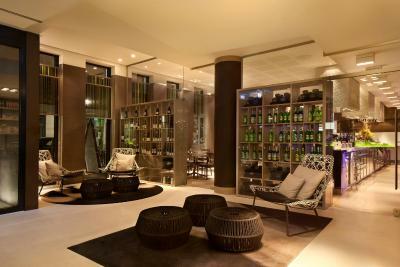 House Rules Hotel Indigo Berlin-Alexanderplatz takes special requests – add in the next step! 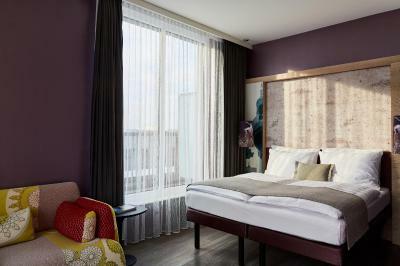 Hotel Indigo Berlin-Alexanderplatz accepts these cards and reserves the right to temporarily hold an amount prior to arrival. The room was a bit too cold for me and setting the thermostat to a warmer temperature didn't seem to help too much. Sound isolation to improve, I could hear my neighbours walking and their coffee machine. Only issue not so good with the hotel/room was the wall between room and our bathroom. Made out of glass and while there is a blocking decorative element you can still see inside to the shower and further. No sound proof either. Was not a huge problem for us as a couple but would not recommend for family members, friends or colleagues if you prefer privacy. 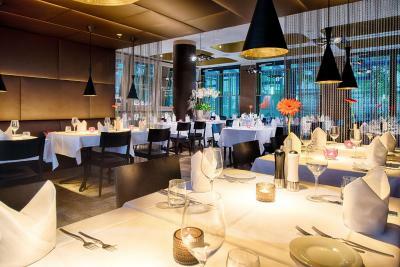 Location is convenient near Alexanderplatz, easy to reach. We had deluxe double room on 7.th floor facing the inner court yard. Room was quiet. If facing towards Alex the sight would be better (tv-tower etc.) but might be more noisy too. Room had enough space and was clean and comfortable. Friendly staff & tasty breakfast buffee. Tiny working desk I was given a room next to the tram so it was very noisy Changed to an upper floor room, which was indeed more quiet but then the WiFi didn't work properly. The only thing was that for two mornings due to technical difficulties, breakfast was held in the Holiday Inn (next door hotel, but with indoor connection). The same food was offered and still a good standard, but the dining room was a lot more crowded. Not really a major issue! We've stayed in this hotel before and chose to come back because we liked it so much. Last time we were upgraded to a deluxe suite due to a booking mistake, so we found the standard double a little smaller than expected this time. However, this is a great hotel - excellent location in the East of the city, breakfast is fantastic, staff very friendly and helpful, rooms clean and with everything you might need. We were given a 5 euro voucher for the bar after agreeing to forego room cleaning for a day - well worth it, although of course once you get in the bar you spend much more than the 5 euros! It was quite loud at night with the trams, I wasn't aware that they run right past the hotel, I saw no mention of it. Also the large pillows on the bed looked great, but they are too soft and slightly lumpy, you don't feel like you really have a pillow and it's not very supportive. Very minor feedback, the phone. You have to switch it on to get a dial tone which I wasn't aware of so I spent a good 10 minutes worried I had broken it. I didn't. First time with Indigo and I really loved the design (bonus points for the Aveda bathroom amenities) I myself work in hotels so expect amazing service when I travel and this property lived up to the standards. The gentlemen on breakfast were outstanding and very outgoing. Thank you Indigo! Pillows were rather worn out providing no support, so we didn't enjoy good sleeps for the 3 nights. Ventilation was off and air-conditioning fixed to extreme warm so no use for it. Hence, air became stuffy in the room during the nights (luckily you can open the windows). Location is good. Breakfast is tasty and with nice presentation. Overall, hotel is clean as well as bathroom. 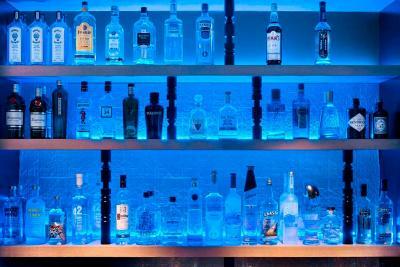 Bar is great at the restaurant! I would’ve liked a room on a higher floor for the view which I’d requested but couldn’t get. Housekeeping tried to enter my room twice without knocking on the morning I was checking out. The room was compact but perfect for one person, it was exceptionally clean and the bed was fantastic! 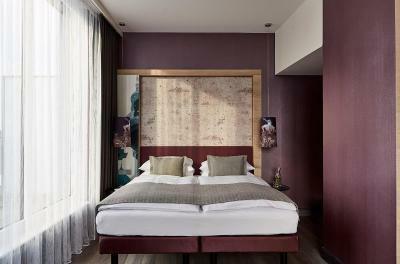 The decor in the room was great and felt like an Indigo property which I love. 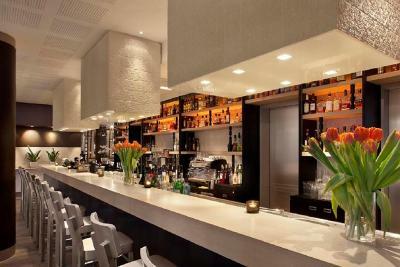 The staff were so friendly, from front desk, to bar staff, to restaurant staff. The host at breakfast both mornings was super friendly and cheerful and she really made my day. Nothing, it was a great trip! Excellent location, near to all amenities. Close to all transport links. Staff are really knowledgeable and very happy to help. Would definitely stay there again.